I’m really excited to introduce Dorie Olds. You may know her more famous ex-husband, Mark Hofmann, the famous forger/murderer. 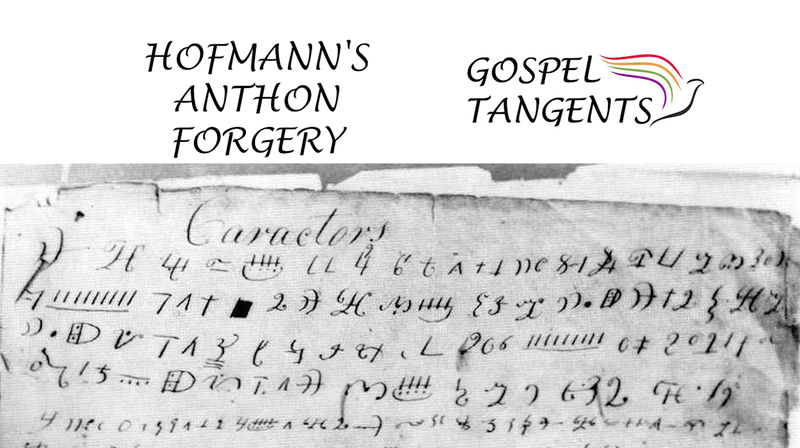 In this first episode we’ll talk about how Mark manipulated her in Hofmann’s Anthon forgery. Check out our conversation! And I remember thinking, “Well, I’m tired. I’m back home from work. I’m tired. I don’t really want to do that.” And I kind of put it aside. And, I remember having this funny feeling. Why do you want me to do this? Because it was like he was really insistent. And he’s like, “Oh, what a surprise! I wonder what that is!” You know? And of course, he’d set that up so that he’d put it in there so I would find it. I would be the provenance. It wouldn’t be him. It would be something that could be documented that in a way he had nothing to do with it because he didn’t find it. I found it, and he had just handed me this book. So that’s the story of how that [came about.] It was the Anthon Transcript and those symbols that were in there. That was glued inside. And then he took them out and he took it from there. And I was the provenance for that. I was his. He was using me to be the provenance of that story. I also asked how Dorie met Mark? Dorie: I was attending Utah State University. I had gone to Dixie College for two years. And then moved up to Logan and was going to do two more years there. And in the apartment complex where I lived, he lived upstairs. So I was on the second level, I think he was on third level. And so that’s how I got to know him was he lived in the same apartment complex. GT: Ok, you didn’t have any same classes together or anything like that? Dorie: No, I didn’t have any classes together. I didn’t know this initially, but he had broken up with his [girlfriend.] He had gotten engaged and had broken up right before school started with this woman that he was engaged to and she would come up and they would sit in, I think it was her car, sit in her car and make out and I’d watch them make out. Dorie: So, I don’t know. It wasn’t anything that was impressed. That was the first thing was, who’s that guy and what are they doing? And how ridiculous. And you know, it wasn’t any like love at first sight. No! Or to be together. It was none of that. That took time to go to that place. GT: So he broke up with this other woman, and then you started dating? Is there any memorable dates? Check out her answers! You may also be interested to hear Curt Bench’s recollections of Mark Hofmann! Dorie Olds tells how Mark used her to add credibility to Hofmann’s Anthon forgery.